Ontario is a four-seasons province ranging from the glorious warmth of summer to the blanketed snow of winter. 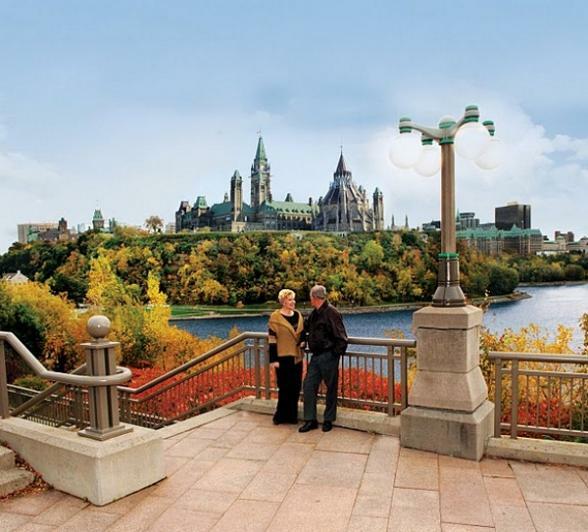 Experience the buzz of urban Toronto and Ottawa or the charm of the quaint towns of rural Ontario. Hear the roar of the natural wonder of Niagara Falls or escape off the beaten track into Algonquin’s pristine wilderness. The energy of Toronto is captured as you wander through the many attractions, galleries and museums. The CN Tower, the third tallest building in the world, is the setting for remarkable views and thrills for the brave. The EdgeWalk takes you outside the building for a walk around the edge of the pod! Just next door is Ripley’s Aquarium, the home to 16,000 aquatic animals including sharks, jellyfish and sting rays. Museums and galleries include the Art Gallery of Ontario and the Royal Ontario Museum. 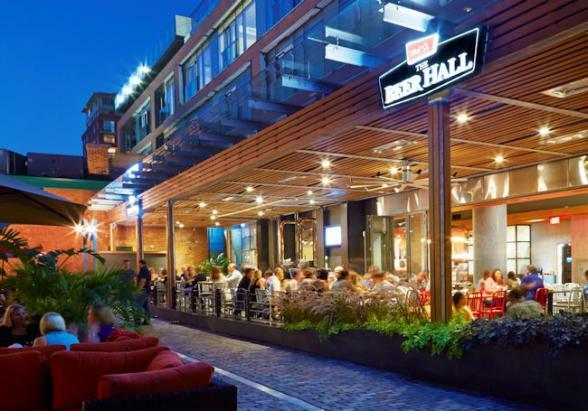 Shopping and nightlife energise the city and Toronto is bursting with shopping districts, designer outlets and malls including the Toronto Eaton Centre with 230 shops. For a different shopping experience, follow the PATH, which links 18 miles of shopping, hotels and restaurants underground. Toronto is renowned for its charming neighbourhoods, in particular the Distillery Historic District which in winter hosts the Toronto Christmas Market, a magical wintery experience. Vintage shops abound in the eclectic Kensington Market, the perfect complement to the trendy up and coming foodie hotspots. Vogue described the West Queen West neighbourhood as the ‘second hippest district in the world’ after Tokyo’s Shimokitazawa. 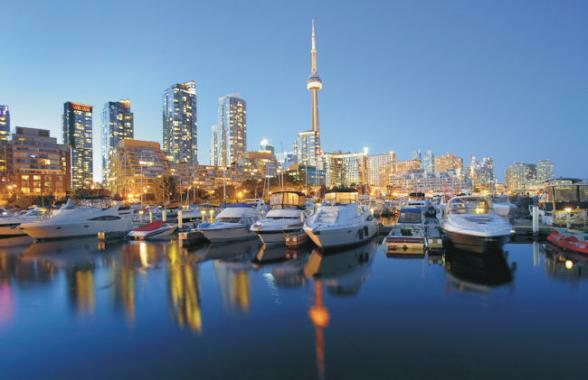 Catch a ferry from downtown to the Toronto Islands and a complete change of pace. 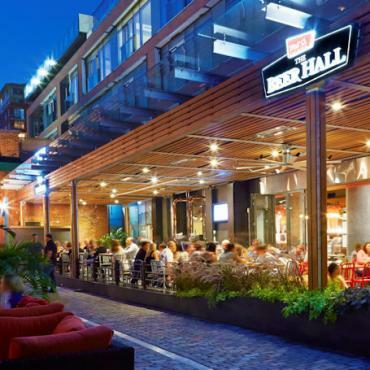 There are unparalleled views of the Toronto skyline by day and night and bars, bistros and sporting events to enjoy. 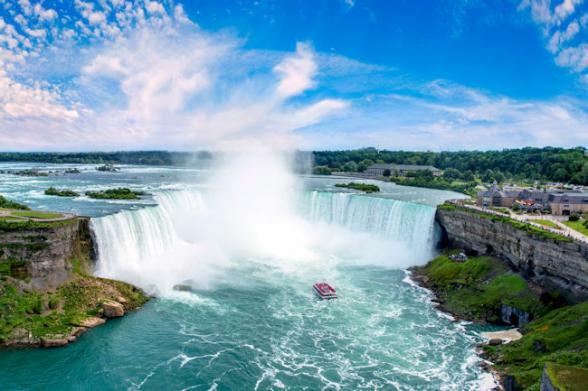 A 90-minute drive south from Toronto is the Niagara Region and one of the tallest natural waterfalls in the world. 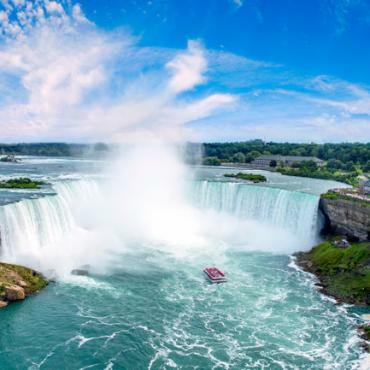 See Niagara Falls on a boat tour such as the Maid of the Mist which takes you to the edge of the Falls’ crashing waters. ‘Journey Behind the Falls’ takes you on an exciting exploration behind the Falls, for an alternative view. Other activities include the Mistrider zip line, an exhilarating wire across the waters, and the Whirlpool Jet Boat Tour for thrill-seekers. Views from the air are covered too, with Niagara Helicopters offering a sweeping view of the impressive vista. By way of contrast, enjoy the quaint Niagara-on-the-Lake. Oozing charm and character, this wine region is among the finest in North America with the local Icewine particularly renowned. 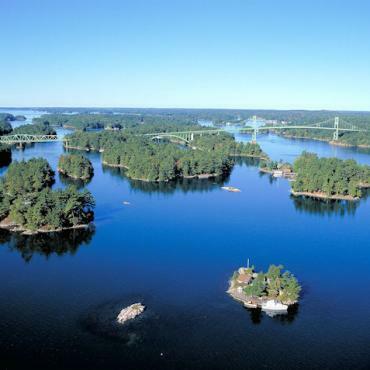 Take in the splendour of the St Lawrence River to discover the 1,000 Islands by boat from Kingston, Gananoque or Rockport and weave among tree-topped islets, enjoying the views of islands with cottages, private mansions and castles, some dating to the 19th century. Here, historic Boldt Castle is a splendid place to linger with its magnificent gardens and imposing stonework. 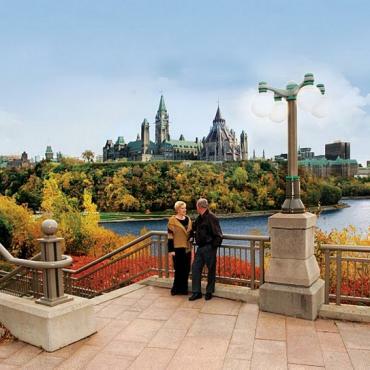 Canada’s capital, Ottawa, is a blend of French and English, celebrating Canada’s rich culture and history through its impressive historical sites and grand Victorian architecture. Year-round festivals and events ring the changes in this setting on the banks of the Ottawa River. See Canada’s Changing of the Guards ceremony, explore the Parliament buildings and check out the plethora of museums including the Canadian Museum of History. Take a stroll along the Rideau Canal (or paddle! ), a UNESCO World Heritage Site and wander the cobbled streets of the ByWard Market, made up of boutiques, stalls and restaurants. Ontario offers a wide range of outdoor activities that can be tailored to your adventure level. Parks and landscapes make perfect settings for tours by water or land and where you can explore nature amidst the abundance of wildlife and wilderness. 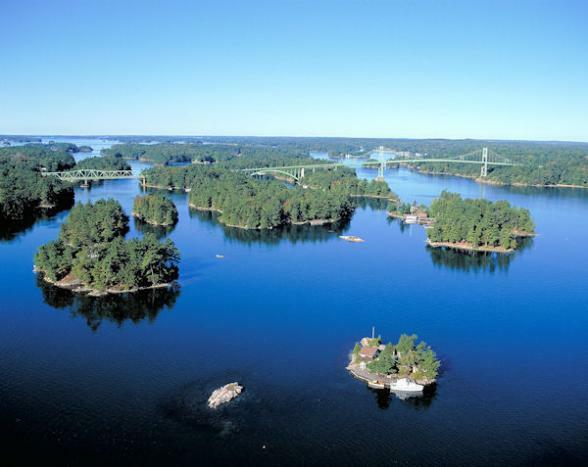 The Muskoka Region is commonly referred to as ‘cottage country’, and boasts gleaming lakes and clear air. 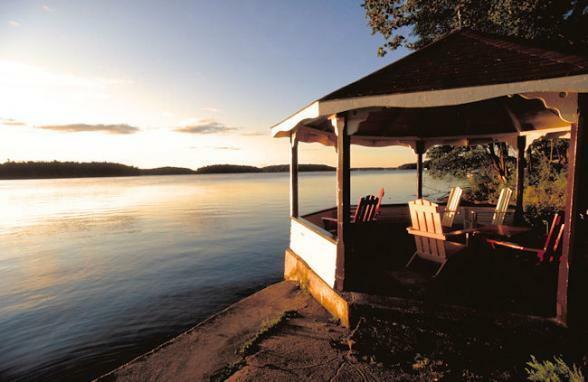 Muskoka is a two-hour drive from Toronto. This, coupled with the variety of outdoor activities and experiences including spas, dining and golf courses, make it ideal for combining urban experiences with outdoor adventures. 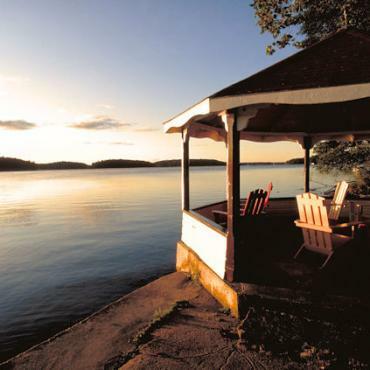 Nearby Algonquin Provincial Park offers far stretches of trees, sparkling lakes and untouched wilderness, creating a dramatic landscape, which can be explored on foot, by bike, or by canoe. 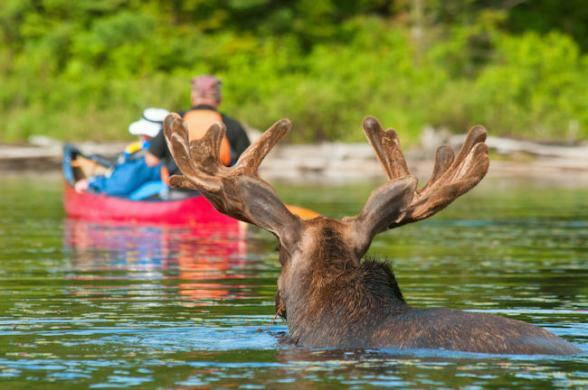 Algonquin Provincial Park is a prime spot for spotting wildlife, including moose, beavers and otter. 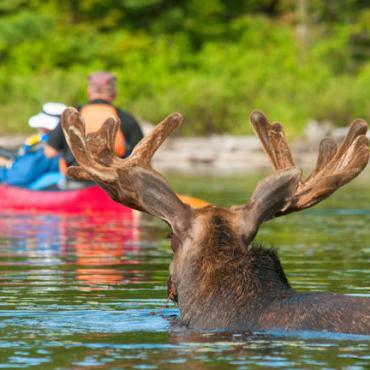 Algonquin Outfitters can take you on half or full day tours. Their Bike Paddle & Lunch Combo Day Trip is a great way to explore the park on two wheels and canoe. For relaxation and rejuvenation the Blue Mountain Resort is an exhilarating playground. You can choose from from the RidgeRunner Mountain Coaster, to climbing walls, and Mountaintop Segway Tours. Relax afterwards in the Scandinave Spa or at the world’s longest freshwater beach, Wasaga Beach. 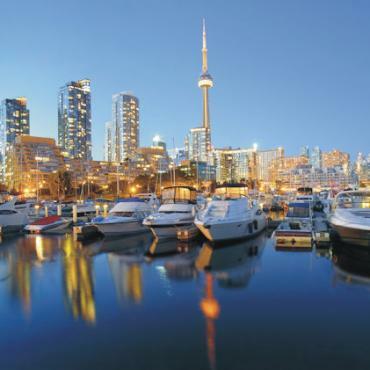 For tailor made holidays to Ontario contact the experts at Bon Voyage. As one of Canada’s most iconic symbols, Le Chateau Frontenac sits high on a bluff overlooking both the historic city and the ST Lawrence River.